Monta Ellis took his Pacers (who are kind of on a bit of roll here) down to Dallas where they beat the Mavericks (who are scuffling at the bottom of the Western Conference playoff picture) 112-105. When Dallas had the ball down six with 17 seconds left, Monta Ellis was in charge of keeping an eye on J.J. Barea, but he went and drew the whole play up for his teammates. You can see him there at the start, as soon as the Mavs line up, he recognizes it and turns around, first telling George Hill that Deron Williams would run up to the top of the key, then dive back into the lane the opposite way on the same screen (or rather, a much more condensed version of that with hand gestures). It looks like this play could have been for Dirk Nowitzki, as Ian Mahinmi completely ignores Williams flying into the lane to stay close to Nowitzki at the three point line. He’s not as clear and direct about it as Rajon Rondo was against the Hawks earlier this year, but I’m pretty sure the last instruction he has is for Solomon Hill to watch out for Chandler Parsons flaring out to the corner. Hill lost Williams a little bit on the screen from Dirk, Mahinmi didn’t give any help because he was staying on the German, and Williams found a backpedaling Chandler Parsons in the corner for an open shot. That’s not what you’d expect from a play the Pacers ostensibly had the drop on, but you’d much rather give up a moving Parsons jumper than anything to Dirk in one of his favorite spots. 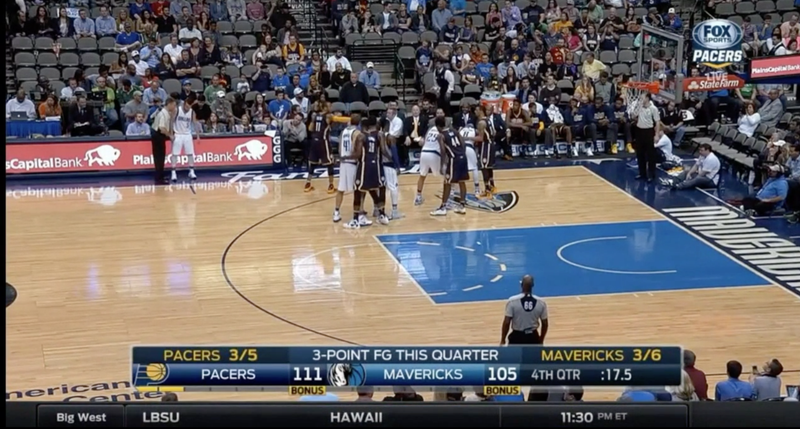 Parsons missed, and the Pacers closed them out shortly after.